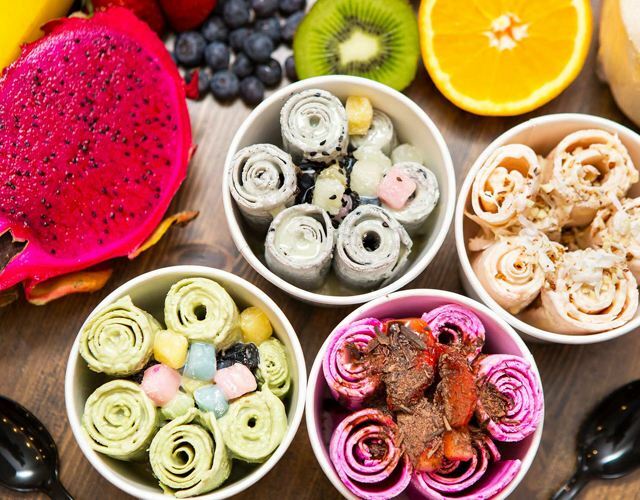 This summer, rolled ice cream could be found at street festivals from New York City to Nashville, Tennessee. At Sweet Charlie's, a store in Philadelphia, customers often wait in line for over two hours to order their rolled ice cream. Some people call it "Thai stir-fried ice cream." That is because it looks like it is made on a hot grill, in the same way people cook meat and vegetables. The ice cream "chefs" add things like cookies, candy, and even pizza into the ice cream mixture. Then, the ice cream begins to freeze. Next, the chef spreads it in a thin layer over the cold surface. After a few seconds, the chef uses a tool to scrape the ice cream off the cold surface and turn it into a roll. The rolls are then put in a cup and covered with fruit or flavored syrup. Thailand most often gets credit for the creation; a popular YouTube channel called "Ice Cream Rolls" reports that the dessert started there. Millions of people watch the channel's latest videos each week. Asia has been coming up with new frozen treats for a long time. A recent New York Times article reported that "elaborate" frozen desserts were written about in Japanese literature nearly 1,000 years ago. And, as one Asian food expert in Seoul, South Korea, told the Times: "You would never be served plain ice cream in a cup here. That would be too boring." Today, many e-wastes have been added into the list of national hazardous waste category. The boy ate several dishfuls of ice cream. They have been missing for a long time now. 1.Thailand most often gets credit for the creation; a popular YouTube channel called "Ice Cream Rolls" reports that the dessert started there. The general always gets credit for his army's victory; the agreement was a triumph for common sense. Henry Ford often gets credit for the assembly line. 2.Asia has been coming up with new frozen treats for a long time. Coming up with a great idea for a new business is only half the battle. I don't hear you coming up with one.